The band would like to thank all the people and groups that have booked us to play for them, over this and other years, and wish them all a very merry Christmas and a happy New Year. Playing for dancing wouldn't be the same without you! Some of you have already re-booked us to play again for your ceilidh next year, and we look forward to meeting you again. You may be wondering where the band name comes from. We won't tell you here, but the photo on the right shows one place where it doesn't!! 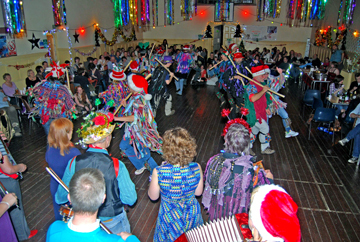 Last year, the band played a Christmas Ceilidh at the Kendal Parish Hall organised by Crook Morris and friends, and this year they invited us to pay a return visit. It was another sell-out, and the capacity crowd had a great evening of dancing with entertainment from Crook Morris and the Kendal Singers with seasonal songs. The photos below reflect the various activities through the evening. The final gig of the year saw the band going out on a high with a visit to the Lindeth Howe Hotel in Bowness where we were entertaining a Corporate group in fancy dress from Thorton-Cleveleys. Their enthusiasm made for a fitting end to a great year of playing and singing. Thanks to Tony and his hotel staff for making us feel welcome and helping the evening go so well. 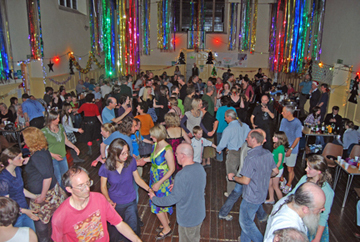 We nearly didn't make the Barrow MC ceilidh in the Malt Kiln at Bardsea due to the floods, but the water receded just in time. Thanks to Mhairi and the rest of the Club for a lively evening. The next gig in November was for our friend Rod Carter to help him celebrate his 60th birthday in Priest Hutton village hall. We played for his wedding to Karen some years ago and it was great to renew their acquaintance. This wedding theme continued into October with the wedding of Rebecca and Trevor at the Castle Green Hotel in Kendal. After the wedding breakfast, Rebecca played the piano and sang a song before the evening ceilidh started. 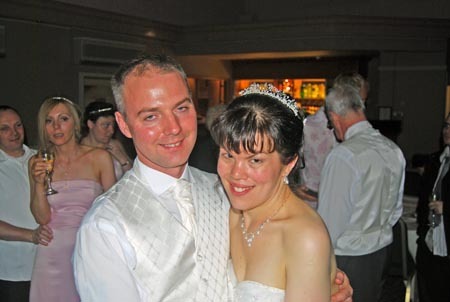 The photo below shows the happy couple at the end of a very happy and busy day. This was followed by a return visit to Bolton-le-Sands where we are always guaranteed a warm welcome at the church hall. It is always a charity fund raising event, and this year they managed to raise £200 for Kendal Mountain Search and Rescue Team. Thanks to May Lloyd and her team for another lovely evening. This year, the band had a long summer break, allowing them to visit a variety of musical festivals including Womad, Cropredy, Sidmouth and Whitby. 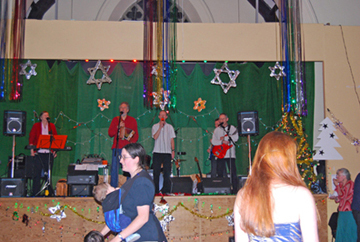 After enjoying these events, they were back on stage themselves for more ceilidhs. The first was at Derwent Hill Outdoor Education and Training Centre in Keswick for the retirement of Dave Hillier, one of their senior staff. A very happy occasion, and good to meet up with Steve Lenartowicz, the Centre Director, after all these years. 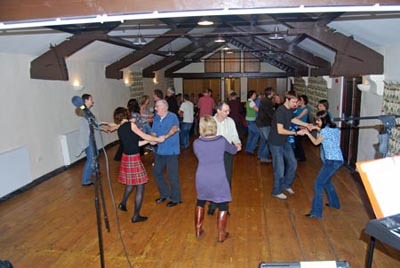 Our next ceilidh was in the Great Hall at Lancaster University for their EAP/Study Skills Programme. 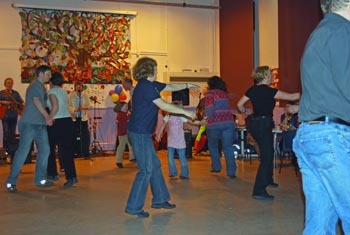 Lots of Asian students getting their first exposure to English country dancing gave a very challenging and fun evening! This was closely followed by the wedding of Hannah and Andrew near Cartmel. The venue was a beautiful marquee at Rod and Mary's farm, and the mix of English and Scottish guests made for a very enjoyable evening, starting and finishing with an Orcadian Strip the Willow, and fireworks in the interval. Rod Wilson, the brides father says -Just a brief and belated note to thank you and your colleagues for your part in contributing to what was a marvellous wedding. 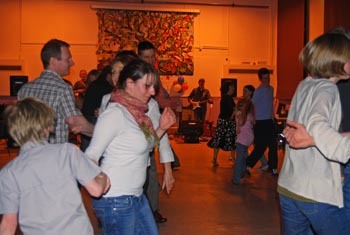 The ceilidh was absolutely brilliant and we would be grateful if you could convey our thanks to the rest of the band. 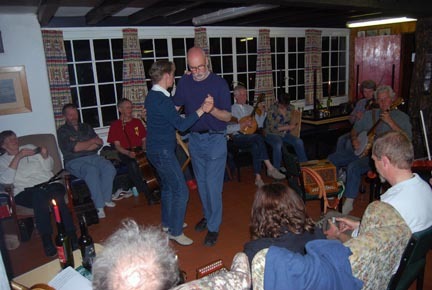 The band always looks forward to their annual Music & Walking Weekend at High House, and this year was no exception. Our special guests were Jenny and Mike from Cambridge who added to the weekend with their playing, singing, dancing, and general good company. This was followed by a 50th birthday party for Liz and Rod in the Victoria Hall in Grange. A good evening in a wonderful hall. The Beer Hall at the Hawkshead Brewery in Staveley was the location for Clare and Kevins wedding in early March. Great beer in an atmospheric setting helped to make for a lovely evening. 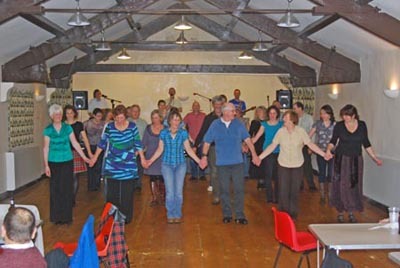 This was followed by Stephens 40th birthday ceilidh held in Kendal Parish Hall. He was also raising money for Manna House, the Kendal based charity set up in April 2002 to provide housing advice, advocacy and support for those in the Kendal and South Lakes area who are homeless or vulnerably housed. 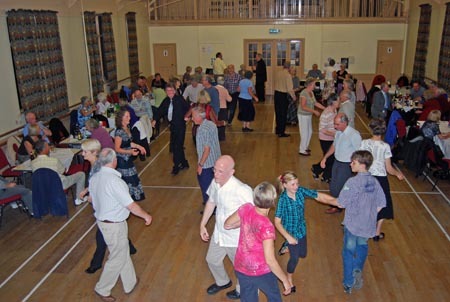 The event was very well supported and it was great to see the dance floor full of people of all ages enjoying themselves. April saw the band travel over to Clarence House in Dalton for the wedding of Vic (Victoria) and Chele. In a new venue for the band, the evening had an international feel as the groom was from Spain and had brought lots of enthusiastic family and friends over for the wedding. 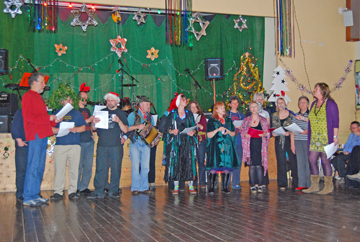 A lively evening was helped by enjoyable singing from the Braddyll Friends singing group. The following Wednesday, the band made a return visit to Hornby for their biennial twin-town social in Hornby Institute. Their 'twins' are from the Loire region in France, and very lively. Next year is the twinnings 30th birthday which they will celebrate in France - bon anniversaire! The band would like to thank all the individuals and groups who have booked us during 2008, and we look forward to seeing those of you who have booked us again for 2009. 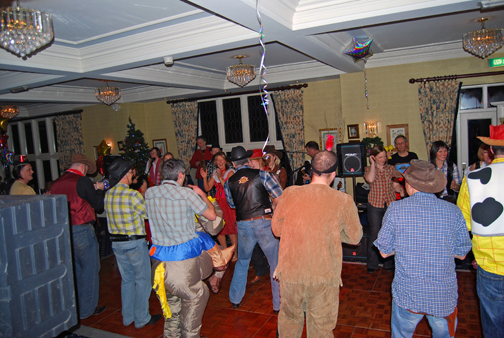 The new year started off with a new venue for the band, the Lunesdale Arms at Tunstall. 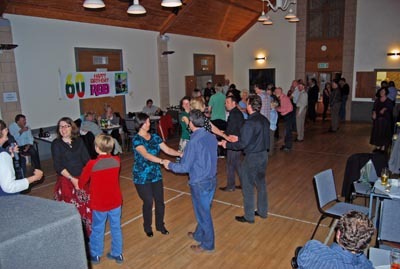 Fiona chose it as the venue for her birthday ceilidh, and it turned out to be a great event with lovely food in a good venue. Recommended! Fiona says -Thank you so much for playing at my birthday ceilidh, you were all fantastic. I loved the blend of music, and the way you got everyone up. 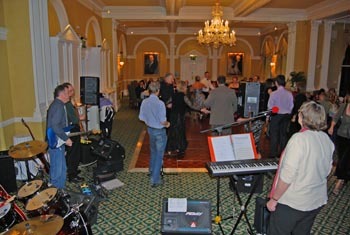 All my guests have raved about the band and how much they enjoyed the evening. Thanks again and all the best. 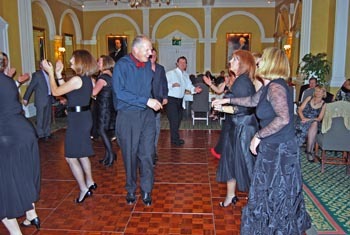 This was closely followed by a visit to the Belsfield Hotel in Bowness for a Head teachers Conference, where Jacqui and her colleagues let their hair down after the evening meal. Hugh belongs to an outdoor activity club in Kendal called K Fellfarers and 2009 is their 75th anniversary. 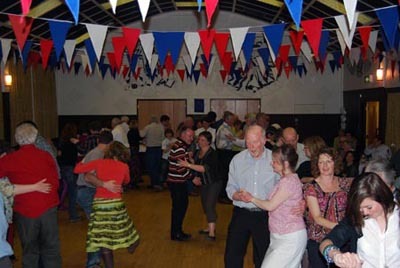 The celebrations started off with a ceilidh held at the Castle Street Centre in Kendal. 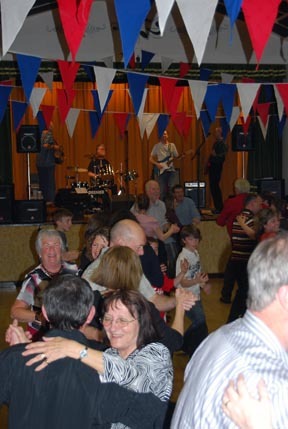 Another new venue for the band, and one worth booking by any group for a function in Kendal. Happy birthday Fellfarers!